R410A is a new type of environmentally friendly refrigerant, does not damage the ozone layer, the working pressure of about 1.6 times the ordinary R22 air conditioning, refrigeration (warm) more efficient. Improve air conditioning performance, do not damage the ozone layer. The new R410A refrigerant consists of two quasi-azeotropic mixtures, mainly composed of hydrogen, fluorine and carbon (expressed as hfc), which is stable, nontoxic and superior in performance. At the same time because it does not contain chlorine, it will not react with ozone, that is, will not damage the ozone layer. In addition, the use of new air-conditioning refrigerant will also be some improvement in performance. R410A is by far the most internationally accepted alternative to R22 refrigerant, and in Europe, the United States, Japan and other countries have been popular. R410A refrigerant is used in new residential and commercial air conditioning systems, heat pumps, dehumidifiers and small chillers. R-410A is also being considered in some medium temperature refrigeration applications. High purity R410A Refrigerant Gas encapsulate in the factory of origin with four different type of packing: 600 g can, 251 b (11.3 kg) disposable cylinder and 926 L recyclable cylinder, ISO-Tank is also available. Over 99.8% purity R410A gas with no turbid and strange stench, can be used as a more environment-friendly replacement of R22 refrigerant. 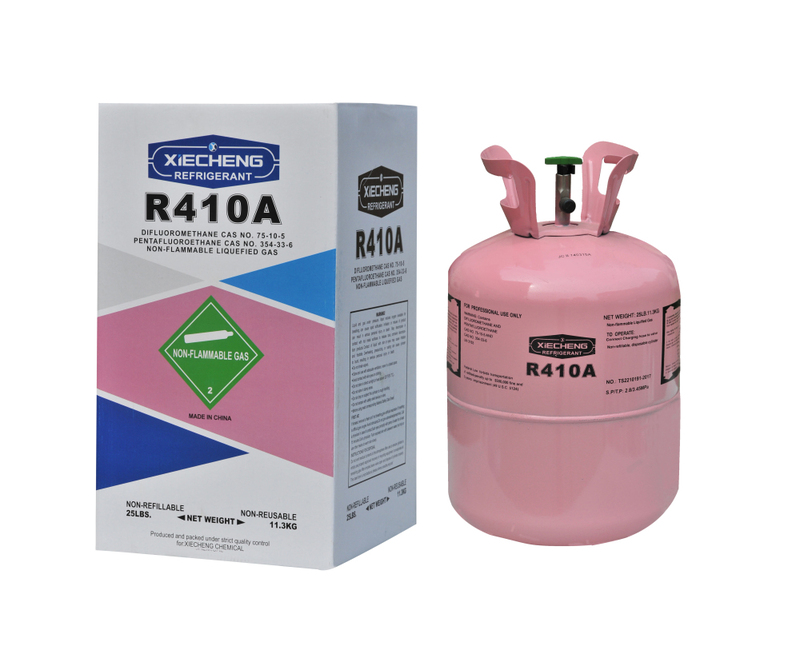 Looking for ideal R410a Refrigerant Gas Manufacturer & supplier ? We have a wide selection at great prices to help you get creative. All the R410a Refrigerant Gas 99.9% Purity are quality guaranteed. We are China Origin Factory of R410a Refrigerant Gas 25lb Cylinders. If you have any question, please feel free to contact us.